Football By Decade returns! In all honesty, the hiatus between our pieces on the 1980s and 1990s was prompted more out of fear than anything else. Why? Any pause in writing in this section of the site comes down to the worry grown out of just how big the 1990s were to football, and the fear of missing some of the most important parts out. However, we are out to do this decade justice, after all it is the first 10 year stretch which The Football History Boys were actually alive for. It was a period in which football was dominated by a number of different things - Manchester United, Ajax, television and commercialism. We are going to look deeper into this intriguing decade - hopefully bringing a staggering ten years to life! When someone says to you "the 1990s", what do you think of? For me it has to be Tony Blair, The Teletubbies, britpop and The Premiership. Once more it is immediately clear that the presence of football is impossible to avoid, highlighting its invaluable importance to wider society. In 1990 however, British Football (where we start) was in a state of disrepute. Just 8 months previous to the turn of the decade, the tragic events at Hillsborough had left questions about fan safety, hooliganism and just which direction British football would take. Of course, since the devastation in the Leppings Lane End, it has been discovered that no hooliganism was evident at the FA Cup semi-final, rather it was a cover-up from the authorities. The issue of fan behaviour was still apparent elsewhere, leading to the Taylor Report and the introduction of all-seater stadiums over the next decade. Liverpool, despite the events in 1989 still heavy on many fans and players minds, managed to win the first league title of the decade and their 18th overall a feat many rivals thought could never be eclipsed. However, if the 1980s were the decade of Merseyside then the 1990s were to be dominated by Manchester. Alex Ferguson had started his regeneration of Manchester United and by 1990 had his first trophy - the FA Cup, beating Crystal Palace 1-0 in a replay at Wembley. On the other hand, League success would have to wait as Arsenal pipped Liverpool to the title in 1991, only losing one game, with the Merseysiders still reeling after losing manager Kenny Dalglish, a man still feeling the effects of events two years prior. "I regret to announce that yesterday Kenny Dalglish told the board of his wish to resign as team manager. Ever since then the board has made strenuous attempts to make him change his mind. As he will tell you himself, he is determined to give up active participation in professional football." Of course this wasn't the end of Dalglish in the game as we will see later but it was a decision which Livepool have arguably never quite recovered from. By 1992 the league went to Leeds, before the mass re-branding of the First Division as the Premier League. The largest ever sponsorship deal in football was struck as the BBC and BSkyB attained the rights to broadcast the top level of English football meaning the top 22 clubs effectively split from the Football League. Since then the Premier League has continued to develop both on and off the pitch as commercial rights and money have led to questions as to the morality of the sport - did football become a business in 1992? It is hard to tell. As long as money has been involved in football, questions about whether it is a business have been asked, even as early as 1888 with the introduction of professionalism. However, back on the pitch the new found Premiership was to be dominated by Manchester United - winning titles in 1993, 1994, 1996, 1997 & 1999. The latter of which was part of a treble (The FA Cup and Champions League) a remarkable feat for the club and manager. 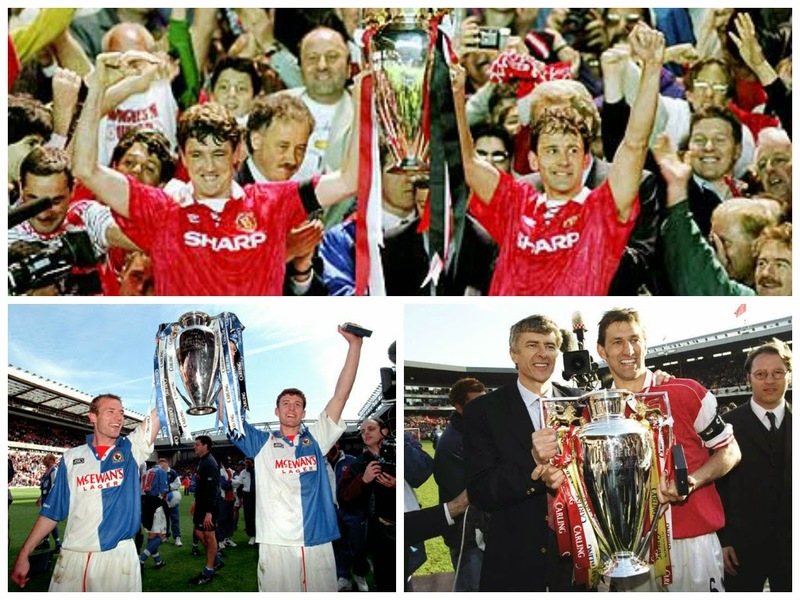 Aside from United's domestic dominance, Blackburn broke the mold in 1995 sweeping the title under manager Kenny Dalglish - funnily enough the trophy was lifted by captain Tim Sherwood at Anfield. It was also thanks in part to the talismanic SAS partnership of Sutton and Shearer firing them to the crown. Arsene Wenger was also introduced to English Crowds in 1996 - before leading his Arsenal side to a domestic double in 1998 - the second in the club's history. "Beckham... into Sheringham... and Solskjær has won it!" If football had seen a mass rebranding in England, then the same can be said for the major continental competitions across Europe. 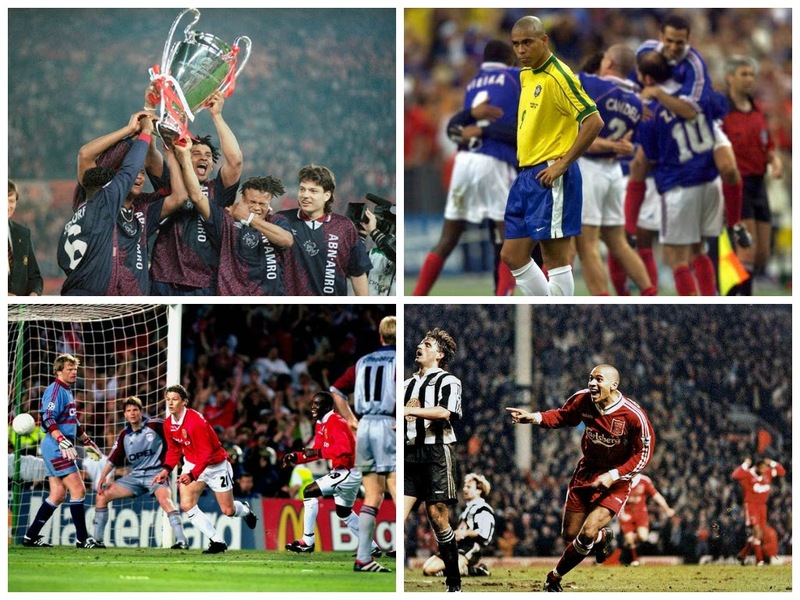 In 1992, the Champions League was established, taking the place of the European Cup. Once again, such a redevelopment was due to TV rights and the growing opportunity for commercial benefits. The 'league' was effectively the quarter-final stage in which 8 teams battled it out in two groups of four before the winners of each faced-off in the final. The first was won by Marseille who beat Milan 1-0 in Munich - a result which still sees some controversy due to the French club's domestic match-fixing. Milan may have lost in 1993, but they were soon to return to the final where they would meet Johan Cruyff's Barcelona "dream team" at Wembley. 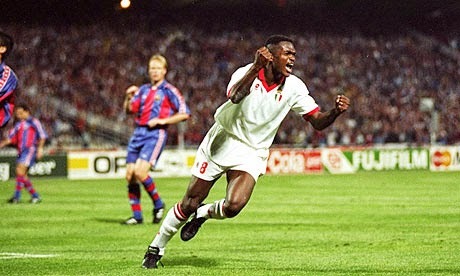 Amazingly, Milan triumphed 4-0 in what is often referred to as the greatest ever team performance in a European final. It was the start of an era in which Italian football arguably offered the best and most desirable league to play in - Serie A. It was the decade of Maldini, Zidane, Del Piero and Weah, global superstars which helped lead to Italian football's continual rise. Fabio Capello's Milan dominated the first half of the period, winning four titles between 1992 & 1996. Juventus were also a colossal force domestically and abroad as alongside three Scudetti, they achieved three Champions League finals, winning in 1996 - defeating Ajax on penalties. Ajax had beaten Milan the previous year to achieve their first European title since 1973. Juventus reached the final in 1997 only to lose to Borussia Dortmund 3-1 in Munich. It was a great feat for German side under Ottmar Hitzfeld who had only narrowly avoided relegation in 1986. Dortmund were the first German side to triumph in the tournament since Hamburg way back in 1983. Domestically the Bundesliga had a familiar feel to it - with a range of teams winning the division from 1990-1995. Bayern, Kaiserslautern, Stuttgart, Werder Bremen and Dortmund all exchanged titles before Hitzfeld's side managed to retain the league in 1996. However, it was Bayern who would finish the decade the strongest winning in 1997 & 1999 - the latter campaign also included a Champions League final which they infamously lost to two stoppage time goals from Manchester United's Teddy Sheringham and Ole Gunnar Solskjaer. Finally we look at Spain. It was another relatively mixed decade on the Iberian peninsula as only Barcelona and Real Madrid managed to secure continental glory, the former under the stewardship of Dutch master Johan Cruyff. Cruyff's side have often been described as one of the best ever assembled with the likes of Ronald Koeman, Romario and Hristo Stoichkov all featuring. The side win four back-to-back leagues from 1991-1994. Madrid broke the Catalan dominance in 1995 with both Real and Atletico winning before Barcelona now with the likes of Rivaldo and Luis Enrique finished the decade the strongest. With 6 domestic league titles and one European Cup it is hard to find a team more deserving of being dubbed the team of the decade, although Manchester United and Milan may argue with that! "Our game was full of risk. I was not even a real defender and had to move into midfield with the ball whenever possible. We also pushed right up in every game. It created fantastic games to watch but we were also punished. We left big spaces behind our defence, but Cruyff said we would win the majority of our games and he was right. We proved that in 1992 at Wembley and people called us The Dream Team." As always we like to finish with our 'Match of the Decade' and this one was relatively easy to pick. We have chosen one from the new-look Premier League - Liverpool 4-3 Newcastle. It is a match which many neutral fans still believe to be the best ever Premier League encounter. The game itself is so well remembered that it has its own Wikipedia entry. Before the game, both sides still had aspirations of winning the league - Newcastle were 3 points off Manchester United with two games in hand - Liverpool were 8 adrift but with the game versus Newcastle in hand over their rivals. 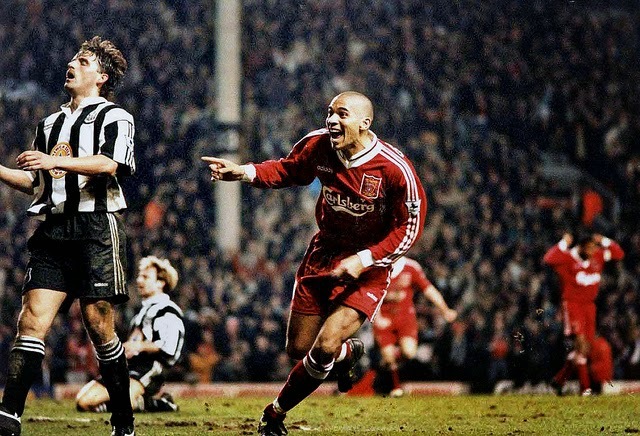 The match was attack, attack, attack from this first minute with both sides exchanging leads before Stan Collymore first equalized to make the score 3-3, before scoring a winner two minutes into stoppage time to lift the roof off Anfield and effectively crush Newcastle's chances of winning their first Premier League title. "There were not so many chances for Liverpool, of course they were pushing hard. But it was just in the last 10 or 15 minutes that we lost the plot."